Fast Cleaners Ltd is a London-based cleaning company providing high-quality window cleaning in London. We have been in the industry for more than a decade already. Started as a family run corporation back in 2001, we continue to grow and are currently one of the best cleaning companies in town. Windows are considered to be a delicate part of any home. Aside from the fact that it’s made from a breakable material which is glass, it is also subject to a good dose of damage prospects. Even minor wall problems and soon reach your windows if you don’t attend to it immediately. Weather also has its fair share of causing window problems. To ensure that your windows are always sparkling clean and shiny it is advisable to hire reliable and highly experienced window cleaners. It may sound like an additional cost at first but in the long run, regular services from the right cleaning company will go a long way. With the help of our window cleaners London team, you don’t have to worry about any damages. They are fully insured and the company itself is also covered. We guarantee that your windows will be clean in no time. Our workers don’t simply work; they also value your time just as how the company values your money. They work on proper time span. At Fast Cleaners Ltd we use advanced equipment and cleaning solutions. 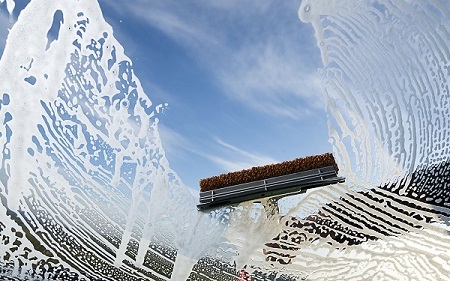 We ensure that your windows will end up sparkling and streak-free. From smudges to fingerprints to major cleaning concerns, our skilled and professional window cleaners can deal with anything. Each member of our cleaning team has gone through essential training to prepare for the job. We offer competitive cleaning prices on all of our cleaning services. More than that, we also support service packages with lucrative deals, which you will find ideal for your budget! We serve both domestic homes and commercial buildings. The rate may be subject to changes depending on the client’s area to be cleaned. Check out our affordable options. Our prices are budget-friendly and tailored to your requirements. We charge a minimum rate of £60.00 for window cleaning. We also over a number of other services such as house cleaning, spring cleaning, end of tenancy cleaning and many others. Interested? Want to know the difference between us and other companies? Want to know why many individuals consider us as the most sought our company out there? Call us now at 020 3907 7263 for more information about our option for window cleaning in London. Our customer service representatives are always there to answer your call and respond to your queries.